KoamTac makes some pretty cool BlueTooth barcode scanners. I’ve used their KDC300i imager with an iPod touch. It’s small, light and fast. 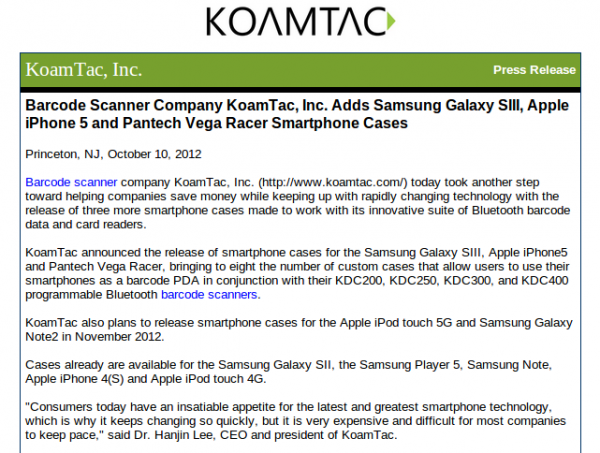 Historically KoamTac has been almost exclusively aimed at Apple equipment, i.e. iPhones, iPod touches and iPads. It’s nice to see that they’re including other popular smartphones as well. I’m particularly excited to see that they have a case for the Samsung Note 2. The Note 2 would make an interesting device if paired with one of the KoamTac BlueTooth scanners, especially when you consider the additional functionality of the S Pen. Pretty cool.